The sides have discussed the current state and perspectives to develop relations between the two states in trade and economic and investment spheres. 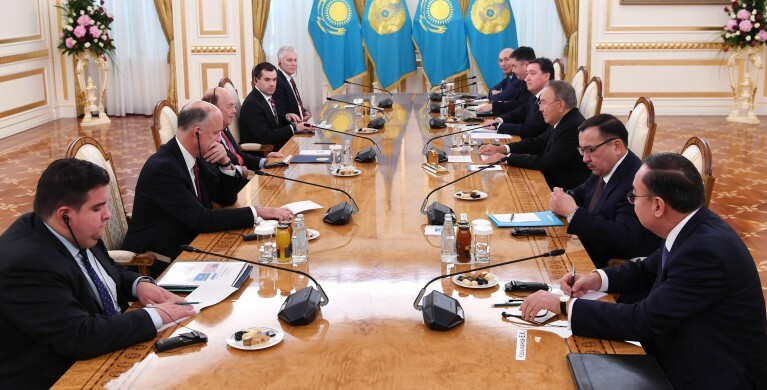 The Kazakh head of state noted that the visit of the Secretary of Commerce reflected the USA's interest to develop the cooperation with the Central Asian region that will facilitate to the strengthening of mutual economic ties, an official website of the Akorda reports. The President of Kazakhstan underlined the results of the high-level talks during his official visit to the USA in January this year. "During the meeting, we have reached a mutual understanding with President Donald Trump. The relations between Kazakhstan and the United States have entered the level of expanded partnership, following which the relevant statement was signed. Within my official visit, I have met with a big group of 'business captains' of the USA. During the joint business forum, 27 various commercial documents for a total of 7 billion US dollars were signed. As of today, the volume of trade between the two states is around 2 billion US dollars. This year this figure has increased by 30%," said Nursultan Nazarbayev. In addition, the head of state has dwelled on the history of the development of cooperation between the two states an talked about the agreements reached in the first years of Kazakhstan's independence. "After Kazakhstan has cancelled nuclear weapons and closed the largest nuclear testing site, we signed the first agreement on cooperation with President George Bush Senior. At that time, Chevron expressed its intention to work in our country. The history of this company's activity demonstrate the success to do business in Kazakhstan," said Nursultan Nazarbayev. The head of state notes that today Kazakhstan conducts a multifaceted policy and maintains kind relations with its all partner countries. In turn, Wilbur Ross thanked the Kazakh President for the meeting and told about his impression of the visit to Astana. "It is my first visit to Kazakhstan. I was amazed by the architecture of the capital city, I saw on my way from the airport. Construction is active here, and, in fact, the economy shows the dynamic increase," said the US Secretary of Commerce. Wilbur Ross noted that a delegation of 16 American companies has arrived with him to Astana intending to develop trade and economic relations with Kazakhstan. The US Secretary of Commerce has conveyed the welcome speech and best wishes from US President Donald Trump to Nursultan Nazarbayev, as well as expressed interest to further strengthen and expand the cooperation between Kazakhstan and the USA.